It’s no secret that Traditional Catholics find themselves engaged in their own war of words over Pope Benedict’s Good Friday prayer and its ramifications. The question is this: Can we maintain a Chestertonian level of civility as we hash this out? I believe we can and we must. On the one hand, Pope Benedict’s “quiet revolution” has already begun to unify the once warring factions of Traditionalism. Last month, for example, traditional Catholic leaders (including editors of some of the movement’s most prominent magazines), hundreds of persons of influence from countries around the world, the Transalpine Redemptorists, many priests from the Fraternity of St. Peter, “Indult” parishes and even one or two from the Society of St. Pius X, signed an international Declaration in defense of the Pope after he’d encountered a fierce media backlash against his Good Friday prayer. I did not expect to see such a show of unified resolve among traditionalists in my lifetime. On the other hand, objections to the Good Friday revision have been raised by a number of prominent Traditional Catholics. Generally speaking, the divide over this issue runs along a familiar fault line. In the wake of the revised Good Friday prayer, perennial arguments for and against Ecclesia Dei expanded to include the pros and cons of Summorum Pontificum. The essence of the debate is nothing particularly new, then. But as the majority of traditionalists on both sides have nevertheless managed to remain united in common purpose for the past twenty years, there’s every reason to expect this rift to be short lived. To be on the safe side, however, I would like to offer the following explanation for why I personally signed the Declaration (my co-signers, able polemicists one and all, will happily fend for themselves) in the hope of clearing the air and perhaps mending a wobbly fence or two. First off, let’s start with a clean slate. The traditionalists who’ve objected to the Good Friday prayer were not standing around with moistened fingers in the air waiting for the wind to blow! They acted according to their consciences. We have a disagreement, yes! But our alliance has withstood far worse tempests. Those of us who accepted the Good Friday prayer also acted on principle. As a signer of the Declaration, I have not, as one emailer suggested, applied for membership with the World Council of Churches (good one! ), and this year’s getaway will be to the Chartres cathedral not the Bohemian Grove. Serious traditionalists on both sides of this divide can agree that the debate must steer a wide berth around the Kingdom of Nigh. Some have raised the point that as Bishop Fellay, a man of manifest wisdom and holiness, has not signed the Declaration the sheer sophistry of the initiative is manifest. True, his Excellency did not sign the Declaration nor, for that matter, was he invited to. It was presumed that the Superior General of the world’s largest fraternity of traditional priests has enough demands on his time without being bothered by laymen trying to wheedle endorsements out of him for this or that initiative. 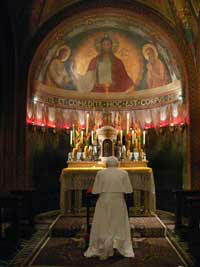 To my knowledge, however, Bishop Fellay has released no official statement against Pope Benedict’s Good Friday prayer. He is, as we’ve long contended, the right man for an especially difficult job, and I’m confident he’ll handle this with due wisdom and prudence. In the meantime, your “pick and shovel” editor saw it as his duty before God and his readers to respond one way or the other to the Good Friday prayer, especially after the Holy Father came under intense attack from non-Catholic quarters. Some critics have contended that The Remnant should have put off lending its support to the Declaration until after the Holy Father had addressed the UN next month. But how could I justify waiting around until it became politically safe to defend the Pope? The decision was based on the text of the prayer and the facts before us—not projections about what may happen tomorrow or next month. The Pope’s address to the United Nations could not possibly change the circumstances that led to our decision on February 11, 2008 to sign the Declaration. Finally, some insist that the Pope’s conciliatory language is a papal sellout to Jewish special interests and the liberal wing of the Catholic Church. But since Abe Foxman and the majority of Jewish and liberal Catholic spokesmen have voiced vigorous objections to the “concession”, I fail to see how this follows. Something else must have motivated the Holy Father. So rather than argue over whether one is obligated to accept the prayer, we turned our attention to the grounds upon which such a papal order could theoretically be rejected in good conscience. And here is where we found an impasse. In his Summa Theologica, St. Thomas presents the principle that we believe applies to this situation. Archbishop Lefebvre himself cited the same principle twenty-five years ago when he faced a similar dilemma. The year was 1983 and the place was the Society of St. Pius X’s seminary in Ridgefield. As “old timers” will recall, nine dissident SSPX priests had jumped ship over the Archbishop’s acceptance of the 1962 Missal of Pope John XXIII (which had been slightly modified by John XXIII’s motu proprio on Dec. 8, 1962, even to include a change to the canon itself with the insertion of "... beati Ioseph, eiusdem virginis..."). It was a time of uncertainty inside the SSPX and out. We were dragged into the fray when some of the same dissidents sued The Remnant to the tune of $10 million for something or other (I don’t recall what, and the lawsuit was eventually thrown out). What is the first principle to know what we must do in this circumstance, in this crisis in the Church? What is my principle? It is not my choice; it’s not my favor; it’s not my personal desire. I am nothing. I merely follow the doctrine of the Church, and this doctrine is expounded by St. Thomas Aquinas. So, what does St. Thomas Aquinas say about the authority in the Church? When can we refuse something from the authority of the Church? Principle: Only when the Faith is in question. Only in this case, not in other cases; only when the Faith is in question, and that is found in the Summa Theologica: II II Q.33, a.4, ad 2m. St. Thomas’ answer is that we cannot resist the authority; we must obey: Sciendum tatem est quod ubi immineret periculum fidei. Periculum fidei, i.e., the danger to the Faith… etiam publice essent praelate a subditis arguendi. The subject can be opposed to the authority if the Faith is in question (“periculum fidei”): Unde et Paulus, que erat subditus Petro, propter imminens periculum scandali circa fidem. Petrum publice arguit, i.e., St. Paul opposed St. Peter because it was a danger for the Faith (cf. Galatians 2:11). That is the principle of St. Thomas, and I cannot harbor another motive to resist the Pope. It is very serious to be opposed to the Pope, and to the Church. It is very serious, and if we think that we must do so, we must do it only to preserve our Faith, and not for any other motive. We must now make an application of the principle. For me, I think that the liturgical reform of Pope John XXIII has nothing against the Faith. You can take the Pontificale, the Rituale, the Breviary, the Roman Missal, and what is in these books of Pope John XXIII that is against the Faith? Nothing! And so I cannot refuse this Missal of John XXIII because he is the pope, and the pope gave me this book and I must obey. At this point in the conference the Archbishop took up the question of the New Mass itself and used the same principle to explain his objection to the reforms of Paul VI. Speculation over why the prayer was revised in the first place may provide for interesting discussion but it is just that: speculation! It could have no bearing on our decision to accept the prayer and defend the Pope against those who attacked him for it. Any number of unfortunate developments could theoretically arise over the next few months to provide fodder for critics of the Declaration to make sport of the fundamental “naïveté” of its signers. But should we really concern ourselves with such petty considerations when the international protest leveled against the revised Good Friday prayer has now expanded well beyond that prayer to strike at the very heart of the divine mandate that Peter proclaim the Gospel of Jesus Christ to the world? The controversy has, in reality, very little to do with the prayer itself, and the sooner traditional Catholics begin to realize this, the better. Whatever one thinks of the decision to revise it, the fact of the matter is the new prayer is Catholic, which is why the ecumenical movement is crying foul. …weighs particularly on the historically difficult issue of Good Friday intercession for the Jews. The ambiguity of having two different propagated forms of the prayer irritates the faithful in the church and has greatly damaged the growing trust between Catholics and Jews. It was also felt that unnecessary damage to this confidence and an annoyance was caused by Pope Benedict who, as far as is known, neither before publication of his Motu Proprio last year nor before the promulgation of the new Good Friday intercession consulted Jewish dialogue partners to discover whether his ideas would hurt their religious feelings. And on and on it goes— with the battering ram of the Good Friday prayer, Benedict and his tradition-leaning reforms were (and are!) being pulverized in the press, and there just didn’t seem to be a lot time for us to sit around and see what would happen next, especially since the mighty neo-Catholic establishment was observing a solemn silence throughout the whole ordeal. Some wondered if perhaps the neo-Catholics are as receptive as sedevacantists to the idea of the Motu Proprio being derailed by massive opposition in the mainstream media. Who knows! What’s certain is this: the Holy Father was (and is!) under intense fire for drafting a prayer that reiterated Church teaching. And if the traditional Catholic effort to defend the Pope for that smacks of unjust compromise, well, in truth, I don’t know what traditionalism is anymore. Some critics argue that the Pope’s new prayer subtly undermines the Church’s "missionary effort" to “convert the Jews”. The problem here, however, rests on a singular lack of evidence for the existence of that effort in the first place. Not a few Jewish commentators who are upset with the new prayer, evidently labor under the impression that not only did that effort exist in history but Benedict is in the process of reviving it. But historians such as the late, great William Thomas Walsh searched for it in vain… all the way back to Peter himself, in fact. Dr. Walsh was the premier Catholic historian of his day. Aside from penning masterpieces based on staggering historical research (e.g., Characters of the Inquisition, St. Teresa of Avila, Isabella of Spain, and Philip II), he is also credited with having personally reinvigorated the Fatima message throughout the English-speaking world. After graduating Yale, Dr. Walsh established himself as the absolute authority on 15th and 16th century European history. He was awarded the Laetare Medale by the University of Notre Dame in 1941, and was honored by the Spanish government in 1944 with the highest cultural honor of Spain: The Cross of Comendadore of the Civil Order of Alfonso the Wise, becoming the first North American writer to receive such an honor. He also received an honorary degree from Fordham University for his invaluable contribution to the historical record. He was a man of notable personal integrity and holiness, as well—a faithful husband and father of six (one of whom became a Sister of Mercy). [Peter] had just as good ground for denouncing the unbelievers—if that was the right way to solve “the Jewish question.” He had heard Christ himself excoriate the high priests and Pharisees to their faces in terrible and holy words never to be forgotten. It must be significant that with such an example before him, Peter never followed it except in a sentence of his first sermon which he qualified in his second with, ‘I know, brethren, you did it through ignorance, as did your rulers.’ It was fitting for Jesus to say what he had said, for the judgment of men had been committed to him as Son of God. Peter was only a man, and though as keeper of the Keys he had the right to forgive or retain sins, he did not regard this, apparently, as permission to lay his hands upon this mystery of repudiation. He who had denied his Lord after living in close friendship with him for three years could never bring himself to the point of condemning men with no such advantage, particularly if they had heard of him in their dispersion, and only from his enemies. He does not even mention the Jews in fact, in his two encyclical letters. This is particularly significant considering the vigorous language he employs against heretics within the Church. It must be more than a coincidence, too, that for nineteen centuries the successors of Peter, numbering nearly three hundred, have followed his [Peter’s] example with a consistency to which Jewish scholars have paid generous tribute. The Holy See has never turned its face against the Jews except to perform its obvious duty of protecting Christians from their unbelief. It has repeatedly stood between them and destruction, down to our own time. It forbade their persecution in the Middle Ages, denouncing such lies as those accusing them of ritual murder, or of causing the Black Death by poisoning the wells. Through all their long exile it followed them with the loving and sorrowful eyes of Peter, who had to listen to God rather than to men. It is a curious fact, too, that although the Church has continued to pray for the conversion of the Jews, she has never made any particular effort to bring it about. The local attempts of individual Catholic zealots in this direction have almost invariably had unfortunate effects both for the Church and for the Jews. Their expulsion from Spain, for example, scattered them through Europe to help promote the disastrous revolt of the sixteenth century. How can Pope Benedict’s Good Friday prayer be said to undermine a conversion agenda where the Jews are concerned that, according to Fathers, Saints and Catholic historians, never existed? Dr. Walsh’s research destroys this particular objection to Pope Benedict’s revised prayer, and would leave the most persistent critics of the Holy Father with nothing more than rash accusations that Benedict is a “Judaizer”. But, according to Dr. Walsh, this too is nothing new. Peter himself, whose love of the Jews was manifest, was thus accused. Sound familiar? The warp and woof of salvation history renders baseless the principal objections raised by traditionalists and Jews alike against Benedict’s Good Friday prayer, which, whether absolutely necessary or not, nevertheless followed the pastoral example set by Peter himself who never ceased loving the Jews even as he committed them to the hands of God until the last days. Obviously, there is mystery here as old as Christianity itself. We know from Matthew 27 that at the moment Christ died on the Cross for our sins on the first Good Friday, the veil in the temple was rent from top to bottom, thus concluding, as even Nostra Aetate admits, "the Ancient Covenant" as the "Cross of Christ, Our Peace, reconciled Jews and Gentiles, making both one in Himself". With their very own existence, the Twelve [apostles]—called from different backgrounds—become an appeal for all of Israel to convert and allow herself to be gathered into the new covenant, complete and perfect fulfillment of the ancient one. The fact that he entrusted to his Apostles, during the Last Supper and before his Passion, the duty to celebrate his Pasch, demonstrates how Jesus wished to transfer to the entire community, in the person of its heads, the mandate to be a sign and instrument in history of the eschatological gathering begun by him. Despite the vociferous objections of his critics, Benedict’s prayer is not anti-Semitic in the least, unless the mere act of lovingly praying for the spiritual wellbeing of one’s fellow creatures is now to be included in the definition of anti-Semitism—highly unlikely, of course, as the astute Rabbi Jacob Neusner of New York recently noted in the German Catholic daily Die Tagespost: "Israel prays for non-Jews, so the other monotheists – including the Catholic Church – should have the same right without anyone feeling hurt." Neither can the revised prayer be said to back away from some alleged "mission to convert the Jews", since said mission never existed. The attack on the Good Friday prayer—old and revised—is thus principally motivated by demagoguery on the one hand and/or ignorance on the other. It is rooted in irrational fear and loathing of something that doesn’t exist, and it is being used to cast a dark shadow over the Traditional liturgy of the Catholic Church. Clearly, this controversy involves so much more than merely a prayer in the Mass of the Pre-sanctified on Good Friday. Benedict’s opponents (inside the Church and out) know very well that every day and throughout the whole world traditional Masses are being restored, and that if this trend continues there's every possibility of the old Faith making a comeback. Would that we traditionalists could all develop a similar appreciation for the potential ramifications of the MP! Lex orandi, lex credendi, remember? Hundreds of priests and seminarians, thousands of families, tens of thousands in number – returning to their knees in front of the altars of Tridentine sacrifice. If you think none of that matters then perhaps you haven’t been in this fight long enough to know what it's all about. It is not now nor has it ever been merely about us or our liturgical "preferences"! For forty years, traditionalists stormed heaven with prayers that a pope would one day admit the old Mass had never been abrogated and needs to be restored to the life of the Church for the life of the Church, the moral and spiritual health of our nations, and souls of our children. Only then could all Catholics begin to understand how it is that this sublime touchstone of the old Faith is the antidote to the errors of the modern world, the bedrock of Christendom and the key to the restoration of all things in Christ. Please, let’s not be so imperceptive as to demand the Holy Father spell everything out for us. It’s the Mass that matters, and he knows it. This is what his MP is all about. This is what he told Michael Davies ten years ago and this is what he’s trying to tell us now. Msgr. Klaus Gamber contended in The Reform of the Roman Liturgy that the New Mass was a "disaster". Let's not forget who wrote the foreword to that monumental work--one Joseph Cardinal Ratzinger. We may disagree with him here and there; we may wish he’d say and do more to recall the Novus Ordo; but consider the storm of hell and fury roaring against him right now for making one change to one prayer to be said at one liturgy offered once a year. Obviously, this is going to take some time. Benedict understands that about which precious few of us know anything at all—Vatican bureaucracy. It took forty years of revolution in the Eternal City to get to this point, and it may take another forty to get back. In the meantime traditional Masses are returning en masse—a dramatic turn of events that absolutely had to happen first if, in fact, the old Faith was ever to rise again. My counsel, for what it’s worth: Pray for the Pope and accept the prayer. Do not let them sabotage the Motu Proprio! Do not let this divide the Catholic counterrevolution. There is nothing in the revised prayer contrary to Faith. In fact, the Holy Father is under attack for its inherent orthodoxy. We must, therefore, be willing to take some risks of our own—even when it comes to our “status” in the little world of traditional Catholicism—to go out and meet him halfway… and perhaps even come to his defense when no one else will.